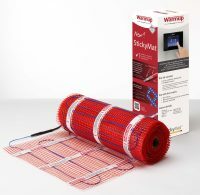 Available in a large number of sizes and in two different heat outputs – 150W for well-insulated spaces and 200W for areas that tend to be colder, our range of Warmup StickyMat systems are suitable for all projects from new builds to restorations. With pressure sensitive adhesive, the mats allow for a fast, easy and secure installation. Suitable for a tiled or stone floor finish, they can be used beneath Vinyl with a covering of an appropriate floor levelling compound. Simple, affordable and designed to be highly effective, heating mats are one of the best ways to heat your radiant home using an underfloor heating system. Warmup provides some of the highest-quality kits and products on the market, and at Atlas Ceramics, we sell a wide range of their heating mats. For a warm and comfortable home all year round, try Warmup Heating Mats. And if you have any questions about these or any of our other products, or current deals and offers, please contact our team and we’ll be happy to help. The main benefit of heating mats is that they are incredibly easy to install. There is no easier way to install underfloor heating in your home. To install the mats, you simply roll them out along the floor, cut them when you get to a wall and roll them out some more until you have covered the entire area to be heated. This means you can install the system very quickly even when you want to heat large rooms. Heating mats form part of an electric underfloor heating system, which is different from a water system (or wet system). Electric underfloor heating systems have a number of benefits over water systems, such as being more affordable and easier to install. Heating mats are the easy way to provide an even level of heating throughout the room. The heat starts at the floor and rises to create a comfortable and even distribution of heating. Heat loss can also be minimised with the right insulation in place. Why Choose Warmup Heating Mats? Warmup Heating Mats can be used with a wide variety of floor types. They are suitable for installation stone and tile floors, but they can also be used with vinyl flooring or timber flooring as long as you use a floor-levelling compound. These heating mats are incredibly thin, which means there is very little rise in the floor level. The dual fluoropolymer coated wires are just 1.8mm thick. Warmup’s mats are also incredibly durable. The wire is taped to a glass fibre mesh, making them tough while also being flexible. Great with laminate or for under tiles. Simple for a professional or knowledgeable enthusiasts to install with confidence. Should You Choose Heating Mats or a Loose Wire System? Loose wire systems are especially suited to smaller rooms that are irregularly shaped and which might have obstacles in the way. This prevents you from rolling out the heating mats easily, so loose wire systems are more suitable in this situation. This is why loose wire systems are often used in kitchens and bathrooms. If you have a regular-shaped room with no obstructions, heating mats are usually the best option. They are especially suitable for large rooms, but they can just as easily be used in small rooms as long as they are regularly shaped. If you are unsure which one you need, just give us a call and we will help you to work out which is the right option for you to buy with a high degree of confidence. We are currently offering a 35% discount on all the Warmup Heating Mats we sell in our store. Simply choose your product and purchase it online, and you will automatically get a 35% discount. This sale will not go on for long, so make sure you act quickly to take advantage of these huge discounts! Warmup Underfloor Heating Mats are called ‘StickyMats’, and they are extremely high-quality, durable and provide excellent performance. They also boast the lowest cable profile you can get, ensuring they are incredibly thin while still warming any room efficiently. We sell two types of StickyMats: 150W and 200W. The 150W mat range in size from 1 square metre to 15 square metres. These are ideal for warmer rooms that are well insulated. The 200W mat range in size from 0.5 square metres to 15 square metres. These are more suited to colder areas with less insulation like conservatories. As the name suggests, these mats have a strong self-adhesive that allows them to be stuck down in seconds. This pressure-sensitive adhesive is fast and easy to secure. When secured to the floor, the mats remain flat with no snags, and the mats can also be repositioned with ease. If you use these underfloor Heating Mats in your home, you will also need a thermostat to control the temperature. We sell a wide range of Warmup thermostats, from manual to touchscreen and smart Wifi models, and they are all compatible with Warmup Heating Mats. You will also need good insulation to prevent the heat from going down into the ground and ensure as much as possible rises into the room. We also sell Warmup Insulation Boards and Warmup Underlay that can be used with your mats. We sell a wide range of sizes and in both 150W and 200W heat outputs. Simply choose your product from our store and purchase it directly from our website and take advantage of our 35% discount. Alternatively, contact us with any questions and we’ll be happy to help. Then enjoy your warm, cosy heated floor knowing that you are using some of the highest quality mats available.